Back in the Octagon for the first time since 2011, former UFC heavyweight champion Brock Lesnar may have answered the questions he had about himself after two bouts with diverticulitis shortened his first stint in MMA, as he returned with a unanimous three-round unanimous decision over Mark Hunt in Saturday’s UFC 200 co-main event at T-Mobile Arena. Scores were 29-27 across the board for Lesnar, now 6-3; the 42-year-old Hunt falls to 12-11-1. After a quick touch of gloves, Lesnar and Hunt circled each other warily for the opening minute of the bout, Lesnar landing first with a kick to the leg. Hunt inched closer, Lesnar missing with a big right hand as he sailed by “The Super Samoan.” With a little over three minutes left, Lesnar shot for a takedown and got it, but Hunt rose immediately after taking a couple strikes on the mat. The two remained locked up until the three minute mark, when Lesnar got Hunt to the mat and kept him there, firing away with lefts and rights. As the punches came faster, Hunt found his way upright, but only for a few moments, as a thudding slam by Lesnar punctuated the round. More from UFC 200: Results | Postfight bonuses | Best pictures from UFC 200 | #AndNew! Nunes wins title against Tate | Lesnar victorious in return to Octagon | Cormier smothers Silva to claim victory | Aldo tops Edgar to claim interim title | Velasquez drops Browne in 1st Round | Pena, Gastelum, Dillashaw go distance for wins | UFC 200 starts with three quick TKO's | Watch: Dana White event recap | Postfight press conference highlights, Brock Lesnar press conference highlights | Backstage interviews: Amanda Nunes, Brock Lesnar, Daniel Cormier, Jose Aldo, Cain Velasquez, Julianna Pena, Kelvin Gastelum, Johny Hendricks, TJ Dillashaw, Sage Northcutt | Octagon interviews: Amanda Nunes and Miesha Tate, Brock Lesnar, Daniel Cormier and Anderson Silva, Jose Aldo, Joe Lauzon | Celebrity interviews: DeMarcus Cousins | Watch the UFC FIGHT PASS prelims on-demand! | Order UFC 200 replay now! 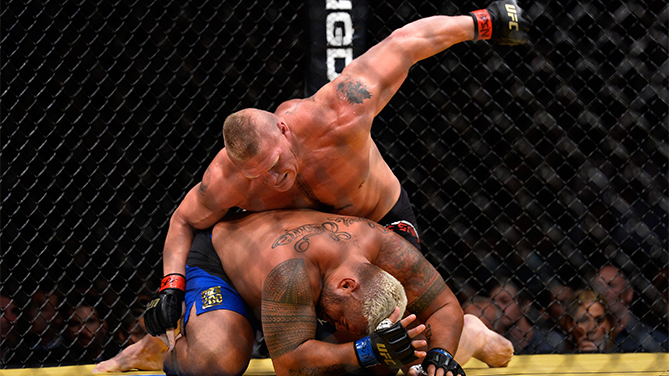 Hunt stalked Lesnar to begin round two, throwing a big right hand to start his offensive assault. Lesnar eluded any danger though, continuing to circle until his first takedown attempt of the round two minutes in, one which came up short. A second attempt was tossed away as well, and Hunt seemed to be getting closer to unleashing some bombs. When he did, he missed, but Lesnar missed with a takedown in response as well. With under a minute left, Lesnar locked up with Hunt, who managed to keep upright until the horn. Increasing his punch output as the third frame started, Hunt left himself open for a takedown, and as the New Zealand native was pinned to the fence, Lesnar landed punches and worked to improve his position, eventually getting into the mount position. There, the former NCAA wrestling champion drilled Hunt with hard shots, but Hunt would throw back punches of his own, avoiding being stopped. But he would not avoid the loss, as Lesnar wrapped up the decision win, his first victory since defeating Shane Carwin at UFC 116 in July of 2010.